RESTORING OLIVIA: Are miracles always instantaneous? I've been thinking about miracles a lot lately. Probably because I am waiting and believing for one. So many of the stories surrounding Medicinal Cannabis as a medication for uncontrolled seizure disorders use this coveted word. Coveted because parents like me want a part of that miraculous effect. Pretty sure I have never personally known anyone who experienced a miraculous healing. I mean, yes, I know many children who have recovered from Autism through diet and biochemical intervention, but to hear of someone receive healing-----someone who was so utterly fatigued, so utterly incapacitated to the point of being unable to speak, and barely drink and eat ------ suddenly recover ------ to regain normal mental functioning ------ like what I am praying for for my precious girl ---- I have not. But then, out of the blue, I did. Have you heard Martin Pistorius' miraculous story? He is the author of the International Bestselling book "Ghost Boy". I was so intrigued by his interview, I just had to read his book, and when I did my already God given, strong faith skyrocketed. When Martin was 12 years old he came home from school one day with a sore throat......and never returned. Over the next year he stopped eating, started sleeping a lot, and said his mind started fading away. He fell in a coma for about 4 years..... and then at 16 his brain started waking up, but no one knew it. He could not communicate that he was in there.....that he understood everything that was going on. His parents were told he had a degenerative neurological disorder to which the cause and prognosis were unknown. Hmmmm....sounds familiar. But he was in there. And so is Olivia, I know she is. Martin's story flooded my aching heart with confirmation...just in the nick of time. Not sure if I have mentioned that its been 15 years. 15 years of feeling certain that behind those beautiful blue eyes is my girl....knowing she is in there but living with the daily frustration that I've been unable to help her, despite all the attempts; just like Martin's parents. Martin and Olivia share some similarities. 1) They were both cognitively and developmentally normal 2) both slowly lost the ability to talk.....and then walk.....and their limbs began to curl inward as their families could only watch as they slipped away 3) Both were treated with medication after medication with no success 4) Test after test were run but they found nothing - with Olivia this included genetic testing. 5) Both went beyond the scope of conventional medical treatments. Olivia in the early stages of losing the ability to walk. We had to tie her to the chair so she wouldn't fall. His book shows many pictures of him being tied to his chair. We started to refer to her hands as "claws" just as Martin talks about. As I read his words I began to feel as though I was hearing Olivia's voice too.... 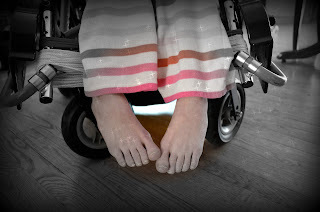 I am certain she probably feels as he did, for instance he said he felt like "A nothingness that is washed and fed, lifted from wheelchair to bed", or that her ".....body ached, the straps on the wheel chair cuts through to his skin... his body aching as he sits for hours every day. He "longed to be with his family, cherishing every moment with them without them even realizing the conversations he played out in his head......if only he had control of his useless body and silenced voice. "Suddenly I know that I'm not alone. Reassuring presences are wrapping themselves around me. They comfort me. They want me to follow them. I understand now that there's no reason to stay here. I'm tired of trying to reach the surface. I want to let go, give myself up to the deep or to the presences that are with me now ---- whichever takes me first. But then one thought fills me: I can't leave my family. They are sad because of me. Their grief is like a shroud that envelops me whenever I break through the surface of the waves. They'll have nothing to grab on to if I leave. I can't go. Breath rushes into my lungs. I open my eyes. I'm alone again. Whatever was with me is gone. Angels. I have decided to stay." This is one aspect of parenting a chronically ill child that many people do not see. The entire family is affected as the parent's hearts break.....and continue to break. The time it takes to be the child's caregiver is immense with feeding, changing, bathing, all in addition to the emotional heartbreak that is present - especially in his case (and ours), where the child used to be normal. I was overwhelmed as I read Martin's account of knowing that God was with him as his mind began to "knit" back together. Can you even imagine? Martin had no control over his his body as he lay there, depending on people to meet his every need. He talks at length about feeling thankful that he could control his mind and when the fear and darkness overtook him he could use his mind to retreat to a world of imagination where he was able to lose hours, if not days in order to retain his sanity. True bravery. To remain when life beckons to be over. His face is all I see now when I hear the song "Held" Natalie Grant - a song about loss, a song about unfairness, a song about God's promise to "hold" us when the "sacred is torn from your life and you survive. This is what it is to be loved and to know that the promise was that when everything fell --- we'd by held". And God held him. For Martin, God was a constant companion. He could feel Him, and was held for 13 years - 4 years while he laid in a coma, and another 9 years during his mind's restoration. We all need to be held --- don't you think? God holds on to us.....even when we resemble a squirming toddler trying to break free from His strong arms. He holds us as we strive, as we run into brick wall after brick wall. He holds us while we try and figure it out. Reading of Martin's strength and courage has put Olivia's situation in perspective. He held me tight, gently pressing my broken heart back together day after day, seizure after seizure....holding me tight since my fleeting flesh longed to escape the daily suffering I was forced to participate in. That right there is the promise, and humility gladly accepts it. Martin was the recipient of two miracles. He survived an illness that took him into a coma AND his brain was healed. Neither of these miracles were instantaneous, but took years to come to fruition. This is what I am getting at. The concept of Olivia's healing was a seed planted in my heart 15 long years ago, and I believe it will come to pass, even though the world may see it differently. In Martin's case, no one believed for years until a massage therapist "felt" he was in there as she talked with him during their daily massage sessions. Her belief and determination to help him was the beginning of his freedom. Of course, there are recordings of instantaneous miracles in the bible (like my favorite --- the epileptic son's miraculous healing by Jesus (Mark 9:14-29)), but God also performed miracles that took days, months...even decades. Consider Abraham and the call on his life. God chose him and promised to make a great nation through him and his descendants. The miracle of becoming a father at 100 years old was actually promised 25 years earlier as he accepted God's calling and set out from Ur. The "father of faith's" journey shows how God gives His miraculous strength to us.... to enable us to persevere through the challenges of even the most difficult calling, like Martin's. Perseverance and the testing of our faith work hand in hand as God uses us in what looks like a "delayed" miracle. Currently I am doing a bible study that starts at the beginning. Genesis. I have done so many of Beth Moore's recent studies, but this is one of her first - 2005 is the copyright, but perfect timing for me. Studying the Patriarch's of the bible enlightens my faith journey as I get acquainted with the struggles of the early bible greats. The reason they stopped short of their original destination could be Terah's (Abraham's father) health, the climate or fear. For whatever the reason Abraham's calling came to a temporary halt until Terah died. Questions of our long haul have been circulating in my brain since the beginning, to which Beth answered in one short paragraph. What can "Terah" represent in our journey? God can call a group, a family or even a village for a certain task, but that doesn't mean they will choose to believe in the calling. Believing is hard, and for some it can be impossible, but that does not change the call God may have on your life. That's where perseverance enters in. Love enables us to go to the extremes necessary to move beyond our "Haran". I love how Beth asks "how do we explain our callings to those affected? Especially those who have never met the Caller personally?" I feel my journey has had different stages, just like Abraham (the first recorded believer). His time in Haran is looked at as a period of transition, which God is famous for. Transitional periods of waiting help us depend on him and trust HIS timing. Can we do His will during those times when it seems like he isn't hearing our cries? Like me, Abraham's journey has its moments of bad decisions made out of fear (telling Pharaoh Sarai is his sister), taking things into their own hands (Hagar and Ishmael) and moments of doubt along the way. Is anything too hard for the Lord? Genesis 18:14 Obviously not in Martin Pistorious' case. Can you imagine witnessing Martin's miracle? Like watching it play by play as he first began to recognize and name pictures then use them to finally communicate his wants and needs to his parents. What a thrill that must have been. And to be there as his hand steadied and his vocabulary exploded. I don't want to divulge his entire story otherwise you would miss out on his incredible page turning book (which Hollywood is currently fighting over the movie rights). Not to be missed! Hebrews 12:1 Therefore, since we are surrounded by such a great cloud of witnesses, let us throw off everything that hinders and the sin that so easily entangles. And let us run with perseverance the race marked out for us. To those who are also on a long difficult journey..........................I'm there too. p.s. Spoiler alert!!!! Martin Pistorious is happily married and is a Web Designer! Go God!!!! Thank You Julie! I will see you next weekend?